Next week on The Public Broadcasting System, Lorraine Hansberry will be featured on the award-winning series "The Masters" the program celebrating Lorraine Hansberry is named "Sighted Eyes and Feeling Heart". It is scheduled to be shown on Friday, January 19, 2018. Lorraine Hansberry died January 12, 1965, 53 years ago today. I often wonder why such a magnificent writer and advocate of justice was taken so soon by natural causes. Lorraine Hansberry died of pancreatic cancer at the age of 34. James Baldwin felt Lorraine Hansberry died of being so gifted and troubled about the plight of black Americans. The disease of stress-related blackness in a segregated society I call it. Lorraine coined the term "to be young, gifted, and black" when many members of the black community felt neither gifted, perhaps young but hardly accepting of their blackness. Lorraine introduced that remarkable phrase to our young brothers and sisters at a time when our communities needed to that elevate their "blackness" as well as singled out their many God-given gifts. Now 53 years after her death at the age of 34 years of age. Today many of our young brothers and sisters have closed their eyes to the beauty of their blackness. Those blacks who can afford it have chosen to hide the majesty of the gift of "blackness" behind cosmetic as well as surgical changes. While many others have chosen to stifle those God-given gifts endowed upon them for rapid cheap rewards rather than tuning into personal and emotional progress. My thoughts this afternoon on The Black Blogger drift towards the incredible genius of Ms. Lorraine Hansberry and I wonder if had she lived just a while longer. Would our black community understand the magnitude of the power of those words in that phrase? We are indeed a race gifted with remarkable talents, incredible black beauty and it is our young who must lead our continued journey to greatness. Yet, our youth in our communities are troubled. We must find a way to re-energize that atmosphere that created the aura of Lorraine Hansberry's young, black, and gifted legion of wonder and amazement. We must demand that hope is reignited and the burning flame of justice shines brightly. 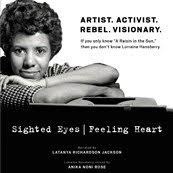 We need to take off the masks of hopelessness and unshackled uncaring hearts for Lorraine Hansberry's reflective thought of sighted eyes and feeling hearts is indeed truly the answer our communities seek. Lorraine Hansberry lived in a period of time when her self-expression was stifled not only due to the color of her skin that endured a racist mix of hatred and ignorance but her sexual choices inhibited as well by having to closet Lorraine Hansberry into a world of denials. Yet even with all of these manmade obstacles, Lorraine rose like the majestic peaks of the Himalayans.